On a moody gray morning I am crouched in a deserted alley next to photographer Andrew Ward. His subject is inert, bulky, and forlorn yet cooperative. Ward lovingly frames the object, putting it center stage in the shot. 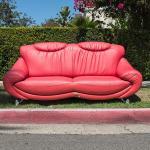 It is a leather love seat—leatherette, more likely. 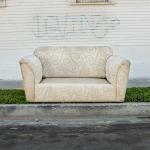 We have been making the rounds of a Westside pocket near Motor Avenue and Venice Boulevard looking for abandoned sofas, and our search has been remarkably fruitful. They are everywhere, in all shapes and sizes: long and lean and covered in stained fabric, chubby and torn and teetering on a remaining leg or two. I am amazed at the number. In the past I had noticed one or two of them here and there as I made my way around the city, but today we seem to have stumbled onto a veritable cache. Ward started this project on a whim three years ago. 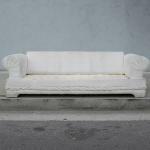 He was driving through Highland Park, where he lives with his French-born wife and two small children, and a couch that someone had lugged to the curb caught his eye. He stopped, took a shot with his iPhone, and an addiction was born. 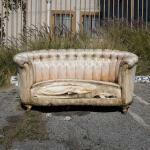 He shows me the image of that first sofa with an almost paternal tenderness. He now has hundreds of photos, the most recent batch captured with a Fuji digital camera. The pictures have a jaunty-sad similarity: the sofa dead center, framed on either side by a few feet of stucco or some foliage. He doesn’t go wide. 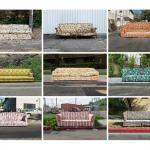 These are, he says with a laugh, mug shots of sofas—which he hopes to turn into a book in his spare time. He makes a living as an assistant director on feature films, but this endeavor is his passion. The fun thing is how quickly I come to share his excitement, my eyes alert to the hunt. There is also a melancholy about these couches now that they are no longer cozily indoors. After all, they are the foundational furniture of family life, the place where we congregate to watch TV or play games or hug our pets. We laugh and argue and make love on them. Now they have been unceremoniously dumped. What happened? Did the owners up and relocate? Or did they simply tire of the deteriorating fabric, the lumpy cushions? Ward says that the sofas show up in the most populated areas, communities like Koreatown, the densest segment of the city, with 42,611 people per square mile. On the other hand, there is Beverly Hills, with only 5,933 residents per square mile, where Ward has never found a single specimen. So yes, it’s about the gap in income levels as well as the fact that Los Angeles has the highest percentage of renters in the United States, people not necessarily staked to their locales—or the cleanliness or beauty of same. There is also a disproportionate amount of stuff left on streets and in alleys where the population is the most fluid. Among them are college environs, along with low-income areas like Pico-Union or South L.A., where families don’t necessarily have the energy or means to deal with their goods when they relocate. But as Ward reminds me on this overcast day, we have found a bevy of castoffs in what are middle-class Westside neighborhoods of single-family homes. It’s clear that his photos offer not just an elegiac archive but also a commentary on the burgeoning trash problem in the city, which is not lost on him. The Dublin-born Ward is equal parts artist and civic Boy Scout, telling me he loves L.A. with the fervor that can take hold of the joyful transplant. Every time he snaps a picture, he dials 311 to report the object, something a lot of people don’t know to do. In his experience, he says, the city sanitation folks will come get it within a week. He generally files between 20 and 30 sightings a month, a number he says is going up. Mindful of the growing piles of household refuse, city administrative officer Miguel Santana commissioned a report that documents the extent of what we face. Released at the end of 2014, it describes our paradise as overflowing with the detritus of our unconscionably messy—or maybe unconsciously sloppy—citizens. 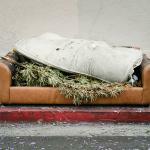 The city spends more than $12 million annually to pick up bulk items like sofas and mattresses, but clearly that isn’t enough. 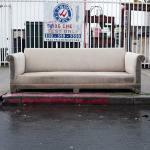 Secondhand stores such as Goodwill won’t accept sofas if they’re in need of repair. Thus it falls to the sanitation crews to do the gathering. They are able to repurpose and recycle some pieces, but most are tossed into landfills with the rest of our once-coveted goods. According to the man who wrote the report, senior livability adviser Mark A. Thomas, we need a task force to forge a plan for tidying a city where only 35 percent of the streets are cleaned on a regular basis. I think of my own seven-foot couch, which has accommodated so many family members and guests and pets, often a heavy gaggle at once. I have had it for 40 years. It has been recovered quite a few times, changing from flowered chintz to gray flannel (which, while handsome, I never liked because it scratched my skin) and then to chenille. For the past 15 years it has sported a soft gray-green velvet. In all that time it has never needed rebuilding of any kind. The pillows have been replumped and the cushions refilled, but the underpinnings are solid. I can’t imagine jettisoning it. Taking pictures of beat-up furniture might not seem as weighty as capturing architectural masterpieces, but I find myself smitten with Ward’s enterprise and how he has sharpened my visual engagement with—and concern for—my city. 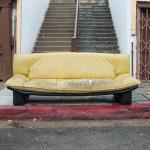 I see sofas everywhere.